Have you ever had a recipe just come together? This Weight Watchers soup is one of those for me. It’s what call a Mexican Chicken Soup. It’s not exactly a tortilla soup or a chili. It is somewhere in between and we love it. It was a super easy recipe that came from having leftover salsa chicken and a few things in the pantry that I wanted to use. It’s now going to be on the regular rotation in our house since it is also a pretty decently healthy Weight Watchers soup! If you are looking for a new Weight Watchers soup to add to your menu plan, I am pretty sure you’ll love this one. It is easy,inexpensive, hearty, super satisfying, and has fairly low points value. We had some tortilla chips with it, but if you are going totally lower calorie or are on a tight points allowance, you can skip the tortilla chips and eat this by itself. I start with making this salsa chicken in my Crockpot. I don’t have a recipe on here for it, but it’s only a 2-ingredient recipe. I use Simply Balanced Organic Roasted Restaurant Style Salsa. It’s one of my personal favorites, but you can use truly any salsa recipe or brand and it will still taste amazing. Since I knew I had made a bit too much of the salsa chicken to use for tacos and quesadillas this week, I decided I could throw it into the Crockpot with a few things and make a soup. We are huge soup fans, and soup is one of my favorite healthy meals since it is filling and inexpensive. This Weight Watchers soup hit all of the marks I wanted. It had the right textures, flavors, and of course, the right points values. I made this in the Crockpot, but you could easily cook this on the stovetop letting it simmer over medium heat for bout 45 minutes to make all the flavors meld. Being an easy Crockpot recipe makes it simple to throw together and have ready when you get home from work. That’s a huge bonus for me. Even though we both work at home, it’s nice to put things together in the morning and just spoon it up when dinner rolls around. 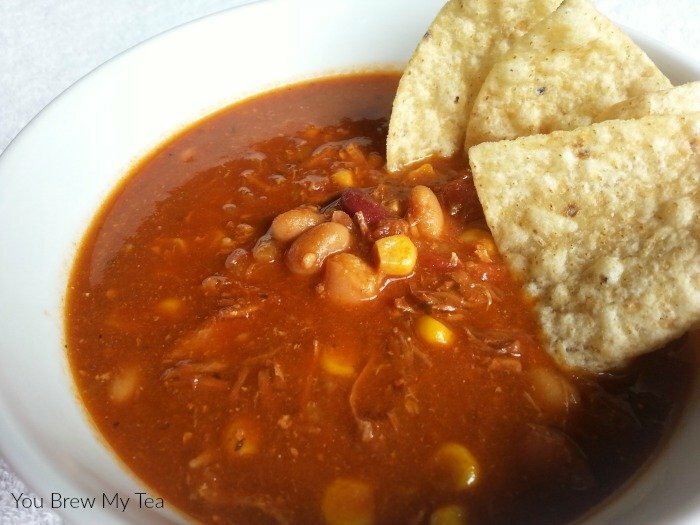 If you like soups, this one is a broth based soup that feels a lot heartier thanks to the addition of the beans and corn. I chose kidney beans and great northern beans, but you could sub pinto beans or black beans if you prefer. I can also see adding fresh tomatoes, fresh bell pepper, or even some fresh cilantro on top for added texture and flavor at a minimal change to the calories! Mix all ingredients together in large Crockpot. Serve alone or with tortilla chips or strips as desired. I have run this through the Recipe Builder within the Weight Watchers App. It calculated at only 5 SmartPoints per bowl! That is just for the soup, so if you add tortilla strips or chips, you’ll need to account for the additional points. 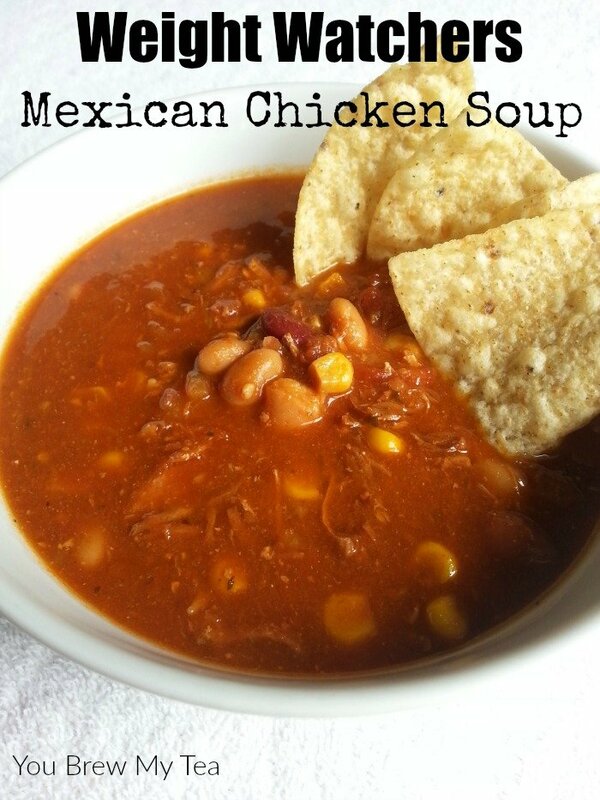 This Weight Watchers soup recipe for Mexican chicken soup is super easy to throw together in the Crockpot. You can even use your favorite taco seasoning to save time instead of the individual spices listed! Sounds great. I would like to invite you to Share the Love Blog Party, love to have you. http://homecookingrecipebox.blogspot.com/2016/05/share-love-blog-party-8.html Hope you can make it. I love how easy, healthy and delicious this is! Thanks for joining us at the Delicious Dishes Recipe Party! Yum, I love making Salsa Chicken in the crockpot, I can stretch it into several meals. Your recipe looks great. Thanks for linking up to #HomeMattersParty hope to see you next week. How much is one serving? One cup, cup and a half? Looks yummy!